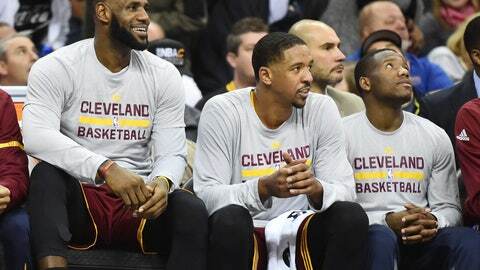 The Cleveland Cavaliers played a full 53 minutes yesterday, and their bench still disappointed. Last night, the Cleveland Cavaliers beat the Washington Wizards 140-135 in what was one of the most incredible games of the season. LeBron dropped 32 points and 17 assists. Love went 11-of-17 with six threes and scored 39 point. Kyrie and Tristan combined for 45 points, but that was pretty much it. The big four had terrific shooting numbers. Not counting Kyrie’s 8-24, the other three combined for 33-of-48 from the field. James and Love combined for 12-18 from three. These numbers are fantastic, and my point is that LeBron was right: this team is too top heavy. Last night, the Cavaliers bench put in 24 points with Korver leading the way with 13. During January, the Cavaliers bench ranked 28th in scoring putting up a measly 26.7 points per game. Well, last night was far worse than that. Only four bench players even saw time in this tedious game. While the entire bench combined for 72 minutes, each member of the big four saw 40+ individually. This will wear down on the Cavaliers. This is where all the surrounding trade rumors start to come to fruition. Most teams know the Cavaliers need a bench and have a couple of young guns like McRae and Felder just sitting their seeing no time. So, why not try to snag the future? Either of two things needs to happen in the next several games. The Cavaliers bench either needs to step up and score much more to alleviate the pressure from their starters, or the Cavaliers need to trade to improve their bench. Tell us. Do you think the Cavaliers will improve their bench by trading or by signing?